DVD Synopsis: Its New Year s Eve in the city of Terminus and chaos is this year’s resolution. All forms of communication have been jammed by a mysterious transmission that preys on fear and desire, driving everyone in the city to murder and madness. With three different directors at the helm, The Signal is, essentially, three short stories weaved into a feature-length film. Connecting the three is simple enough, seeing as they all tell the same disturbing tale, and even the characters move freely from one part to the next, thus transforming each successive yarn into a seamless continuation of the previous one. The real differential between The Signal’s various sections is their tone, which becomes immediately obvious once the second sequence begins. 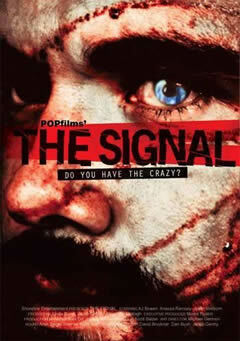 Having already launched us into this world by way of some horrific killings, The Signal then changes gears and becomes a very dark comedy in which a young couple’s scheduled New Years Eve party is thrown into disarray by the outbreak of violence. The blood is just as plentiful as it was in the first sequence, but instead of hiding our eyes, this time around we're laughing out loud.